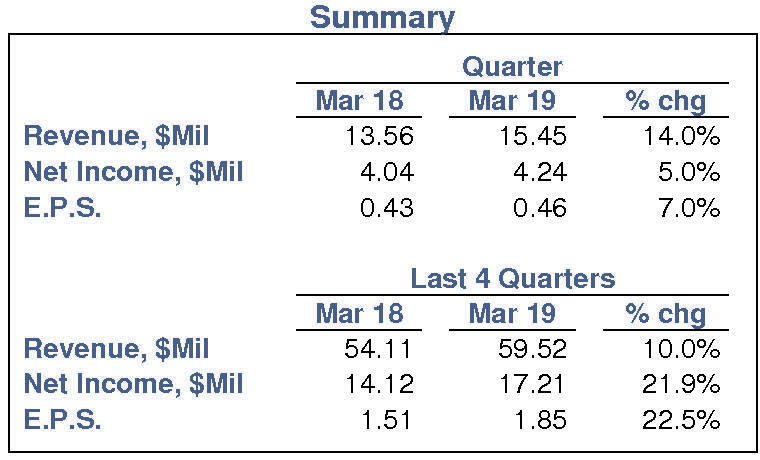 HomeAlertsNew EarningsAlert: New Earnings Report (4/12/19)-Ames National Corporation (NASDAQ: ATLO). Alert: New Earnings Report (4/12/19)-Ames National Corporation (NASDAQ: ATLO). Ames National Corporation (NASDAQ: ATLO) has reported E.P.S. of $0.46 for its first fiscal quarter (ending March 31) versus $0.43 for the same period a year ago — an increase of 7%. E.P.S. were $1.85 for the latest four quarters through March 31 versus $1.51 for the same period a year ago — an increase of 23%. Ames National Corporation (NASDAQ: ATLO) stock closed at $26.77 on 4/12/19 after an increase of 1.7%. However, exceptionally low trading volume at 33% of normal accompanied the advance. The stock has performed in line with the market over the last nine months and has risen 1.9% during the last week. ATLO’s future returns on capital are forecasted to be above the cost of capital. Accordingly, the company is expected to continue to be a Value Builder. Ames National has a current Value Trend Rating of C (Neutral). The Value Trend Rating reflects consistent signals from PTR’s two proprietary measures of a stock’s attractiveness. Ames National has a slightly positive Appreciation Score of 65 and a neutral Power Rating of 43, resulting in the Neutral Value Trend Rating. In light of this new information we are reviewing our current Overall Rating of C. This review will be completed in the next several days. During his career, John has developed valuation and stock rating methodologies, managed institutional portfolios and mutual funds, and provided equity research to institutional investors on thousands of companies. He has been Director of Research at PTR since its inception in 2004. Rating Update: Stock Rating B-Positive (4/12/19)-Rogers Communications Inc (RCI). Rating Update: Stock Rating C-Neutral (4/15/19)-Ames National Corp (ATLO). Rating Update: Stock Rating C-High Neutral (2/14/19)-Ames National Corp (ATLO). Alert: New Earnings Report (10/19/18)-Ames National Corporation (NASDAQ: ATLO). Alert: Rating Downgrade (10/5/18)-Ames National Corporation (NASDAQ: ATLO).